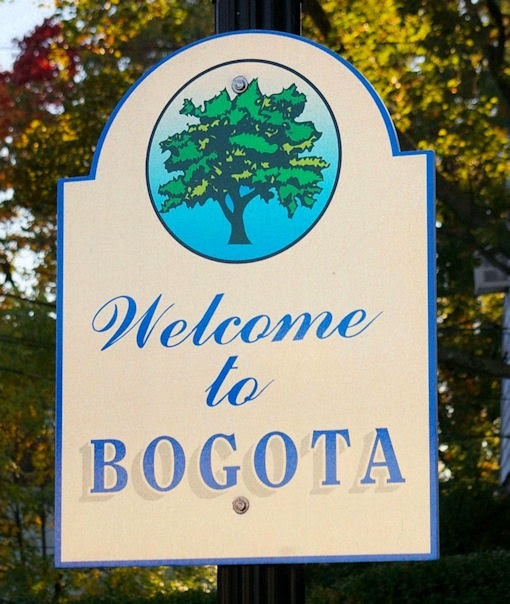 Before the regular Bogota Borough Council Meeting the winners of the Miss Bogota 2015 Pageant and members of the High School Honor Society will be recognized by the Mayor and Council. Afterwards they will be holding their regular Council meeting and work session starting at 7:30p in this is schedule to take place in the Seniors Center which is located on the second floor of the Bogota Library. The Bogota Public Library is located at 375 Larch Ave, Bogota , NJ. This meeting is open to the public. 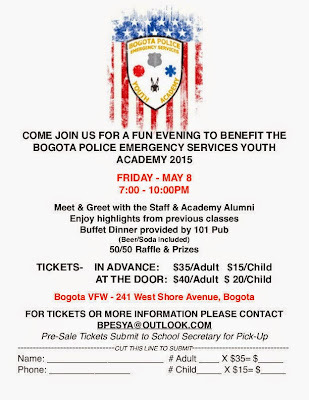 The Bogota Police Emergency Service Youth Academy will be holding a fundraiser benefit for Class 05. This will be at the Bogota VFW Main Hall located at 240 Leonia Ave Bogota, NJ. Tickets are now available costing $35 for Adults and $15 for youths. Tickets will be available at the door for $40 for Adults & $20 for youths. This will feature a Buffet dinner including refreshments. 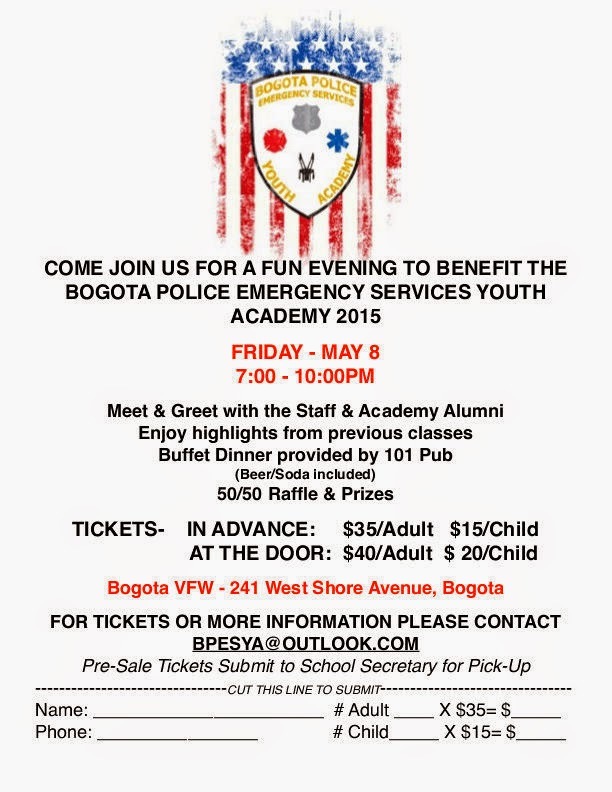 Staff and officials from the Bogota Police Emergency Service Youth Academy will be on hand to talk to Graduate Cadets, and will be available to answer any question Student , or Parents may have about signing up for class 05. Proceeds from this event will go to help fund BPESYA Class 05 in July of 2015. 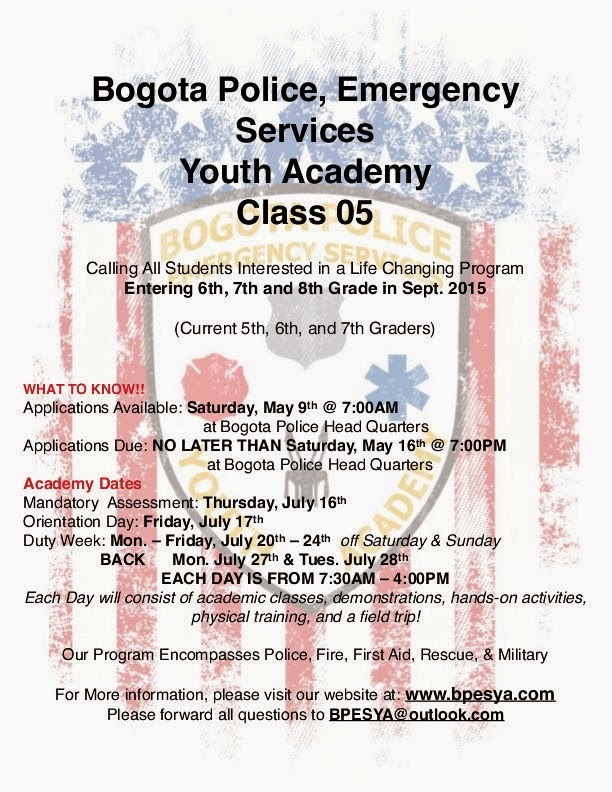 The Bogota Police Emergency Service Youth Academy will be accepting applications of Student who will be entering grades 6,7 &8 for the school year starting in September 2015. Applications will be available on Saturday 9- May starting at 7:00a. at the Bogota Police Headquarters ( or at the W.Broad St. firehouse). - Monday- 4- May they have a home game against Cresskill at home at the Fiegel Field Baseball Diamond, first pitch scheduled for 4:00p. - Saturday-9 - May they have a home game against Wallington at the Fiegel Field Baseball Diamond, first pitch scheduled for 11:00ap.